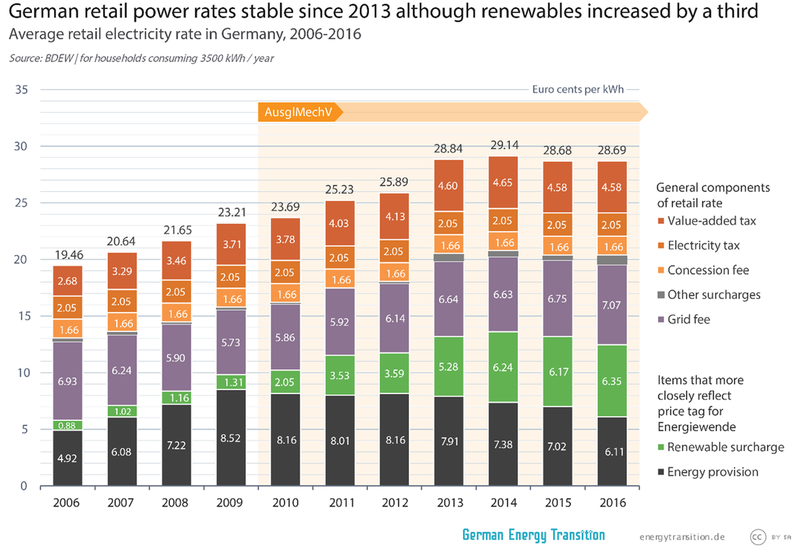 For the past four years, the average retail power rate in Germany has been stable, even though the share of renewable electricity rose from nearly 25 percent to 32.5 percent. Clearly, renewables are now so competitive that fast growth no longer has a major cost impact – not even in Germany. Craig Morris explains. To understand the situation, we need to look at some components in the retail rate – and especially one particular change implemented in 2010. The cost of renewable electricity is easy to calculate in Germany; just add up feed-in tariff payments. Divide that amount by the number of non-exempt electricity consumed, and you get the renewable energy surcharge. But feed-in tariff payments and the surcharge do not move completely in unison. The payments themselves skyrocketed from 10.8 billion euros in 2009 to 19.2 billion euros in 2012 – nearly a doubling – as Germany installed a lot of photovoltaics when it was still expensive (that’s over). Meanwhile, the renewable energy surcharge nearly tripled from 2009 to 2011 alone – increasing far more than the feed-in tariff payments – while the retail rate only grew by less than 10 percent (see chart below). What’s going on? In 2010, a law with the unpronounceable abbreviation AusglMechV was implemented. Back in 2009, when wholesale power prices were at an historic high and expected to rise even further, German policymakers had an idea: why not redesign the renewable energy surcharge to reflect not the absolute level of feed-in tariffs payments, but the difference between these payments to producers and sales of that electricity on the power exchange? It was hoped that this process would reduce transaction costs for utilities and grid operators – but also that a rising wholesale price would underscore the competitiveness of renewable electricity, which was becoming less expensive. The move was not without its critics at the time. One pair of authors wrote in 2009 (PDF in German) that a growing share of wind and solar would automatically reduce wholesale prices, thereby making the surcharge grow, not shrink. This result is now called the “cannibalization effect,” and we have written about it in this blog. The issue is also receiving increasing coverage in the Anglo world. And indeed, wholesale prices are down dramatically. After peaking in 2011, they have been cut in half. There are various reasons for the reduction, but one of them is definitely the fast growth of renewable electricity. In the chart above, we see that the combined price of “energy provision” (black area) and the renewable energy surcharge have remained fairly stable since 2010, when they were coupled (the wholesale price is within that black area). The total increased only from around 10.2 to 12.5 cents. During that same timeframe, the share of renewable electricity nearly doubled – but the renewable energy surcharge has tripled since 2010. Because the concession fee (AusglMechV) links the surcharge and “energy provision,” the two together better reflect the actual cost impact of this green power than the surcharge alone does. Thus, the reduction in “energy provision” costs partly offsets the increase in the surcharge. Note in particular that the cost impact has actually fallen since 2013 from 13.19 cents to 12.46 cents – even as the share of renewables grew by almost a third in that timeframe. Here, we begin to see why practically everyone agrees that the renewable energy surcharge is not suitable as a price tag for the Energiewende. German energy expert Uwe Nestle likes to point out that the surcharge would increase even if no new wind farms, biomass units, or solar arrays were built. Lower coal and gas prices, for instance, would then make renewable electricity look more expensive in Germany. German experts like Berlin-based think tank Agora Energiewende therefore prefer to use the renewable energy surcharge along with the cost of energy provision as a more representative price tag. Looking forward, the surcharge is likely to increase because the German government is giving priority to offshore wind, which is considerably more expensive than onshore wind. At the same time, the government claims responsibility for the current retail price stability, which clearly precedes the 2014 amendments to the Renewable Energy Act – and wouldn’t have made themselves felt until 2015 anyway. On the other hand, the nuclear phase-out will remove a lot of capacity by 2020, which should increase wholesale prices, thereby reducing the surcharge. It’s a messy issue, but the main take-away for foreign onlookers is that the cost increase is over in Germany. 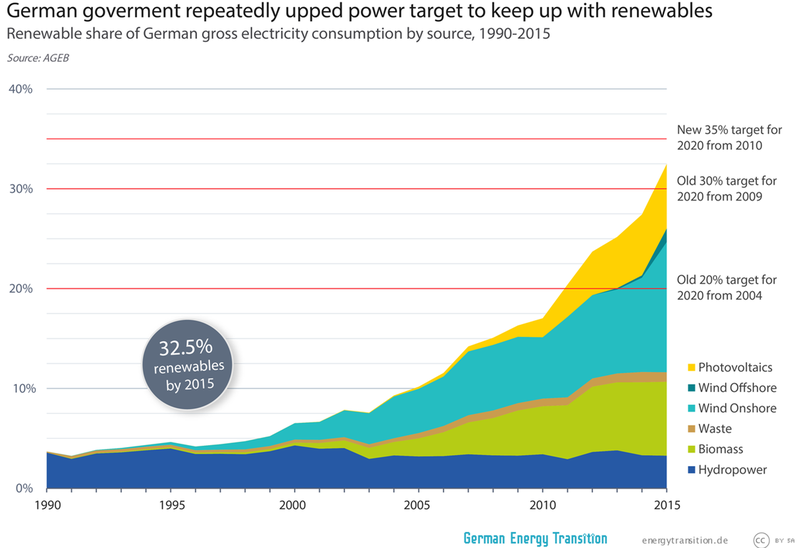 Anyone adding renewables now can do so affordably, as Germany now shows. “We can keep the nuclear power plants running at these prices – but it isn’t worth replacing the fuel rods,” Mr. Terium said matter-of-factly. Previous PostDid French officials downplay nuclear incident? Is French media now?